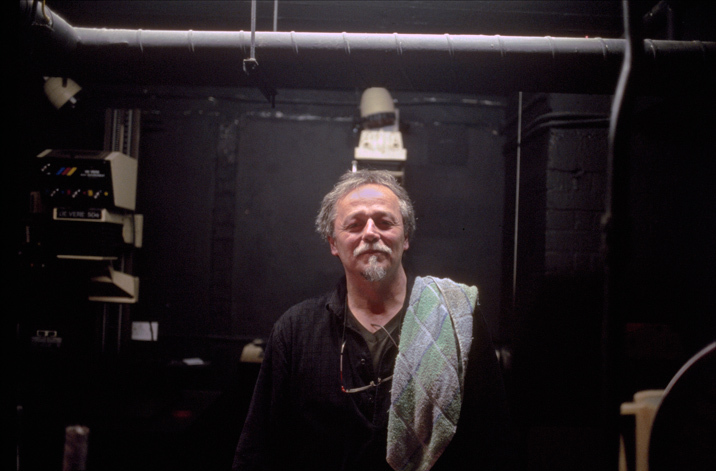 Jeremy Ramsden in his darkroom at Labyrinth, Bethnal Green. © David Secombe 2011. One of the things that is being lost in our back-lit, screen-bound digital world is the texture associated with older forms of image-making. As someone who became a photographer because I liked the idea of making something, of leaving something tangible behind me, I mourn the gradual passing of the physical photograph: the transparency, the negative and the print. Traditionally, the relationship between photographers and their printers was not always easy; not every photographer could print their images like Eugene Smith or Don McCullin, and even if they could, they couldn’t always spend hours in the darkroom when they were busy shooting. Some printers would – justifiably – resent having to fix their clients mistakes or deal with photographers who didn’t really know what they wanted their prints to look like. But others took a more lenient view of photographers’ foibles and would, where necessary, give them an informal technical training to go with their prints. And from the mid-1980s,advances in reproduction technology and an increasing acceptance of colour negative film as a serious format for serious photography ushered in a new era of image-making. Professionals were liberated from the unforgiving tyranny of the transparency – more room for manoeuvre after the shoot, more latitude of exposure and expression, a level of freedom previously available only to those who shot black and white. It was in this arena that colour printers like Brian Dowling and Jeremy Ramsden reigned supreme. Jeremy Ramsden, who died last week, was one of the finest colour printers of his generation. Jeremy could take a frame of anyone’s film and turn it into a work of art on paper. The quality of Jeremy’s work is only partially discernible on a website, because the sheer physical beauty of his prints, their intensity and almost holographic clarity, can only be experienced by personal appointment. Jeremy’s fanatical attention to detail was apparent in the way he would, as a matter of course, produce a variety of prints from the same frame, with each print having its own distinct mood and character. Variations on a theme, if you like, the creation of totally different images from a single piece of film. And when you got your negatives back, you’d see his meticulous notes written on little strips of masking tape affixed to the protective sheets. Jeremy went to these lengths because he cared, because he was an enthusiast for photography. And when you consider the names on his client list – which included the likes of Tim Walker, Elaine Constantine, Harry Borden, Brian Griffin – the breadth of his achievement becomes clear. Jeremy was Australian (not for nothing was his erstwhile lab in Shoreditch called Outback) and he arrived in London as a merchant sailor in the early 1970s. He knocked around London’s photo scene in a variety of capacities – studio assistant to the likes of Brian Duffy and Angus Forbes, freelancing as a photojournalist (he was a very fine photographer in his own right) and mastering all aspects of the arcane art of colour printmaking. His experiences of the glory days of Soho in the advertising boom of the 1970s and 80s would have made a very interesting book. Jeremy had a stereotypical Ozzie enthusiasm for travel, people and a good story – but, above all, he liked sharing his enthusiasm for the world and how we see it. He was generous with his time and, like our friend John Driscoll, who died last year, he was a champion of photographers. Having Jeremy or Brian or John in your corner was like having a secret weapon; if you had the nod from them, you could breathe a little easier. They knew the score. I always thought it was important to earn the respect of the people who handled my pictures, and I think most photographers would agree – although there were some ‘celebrated’ photographers who relied a little too heavily on the expertise of darkroom staff to produce their meisterwerks. But Jeremy spoke of his clients very warmly, and this was because he was reluctant to print for anyone he didn’t respect; so an unsolicited compliment from Jeremy was worth far more than one from almost any picture editor. It is hard to write a piece like this without sounding nostalgic or merely old; but it seems to me that apart from the loss of the tactile aspect, the ubiquity of digital imaging has led to the erosion of a social element within photography. I’m not the only one who misses that. It is hard to think of Jeremy not being there to work his magic on a print, to offer his take on it, see the potential of a negative fully realised – and then discuss the competition and swap stories over a pint. A couple of years ago, Jeremy co-founded Labyrinth, a darkroom in the East End which has become a mecca for new and established photographers. Jeremy was full of excitement for the young talents who were bringing their pictures to him, the brave ones who had chosen to render their images on film rather than as pixels on a chip. He was rejuvenated by the challenge and, apart from anything else, it is a tragedy that he will not see his fledglings develop and mature. He gave a great deal and asked for very little in return. Personally, I owe him a huge amount – and the shock of his sudden passing still hasn’t sunk in. I can’t quite believe it. The industry will feel a lot colder without him. The world will too. 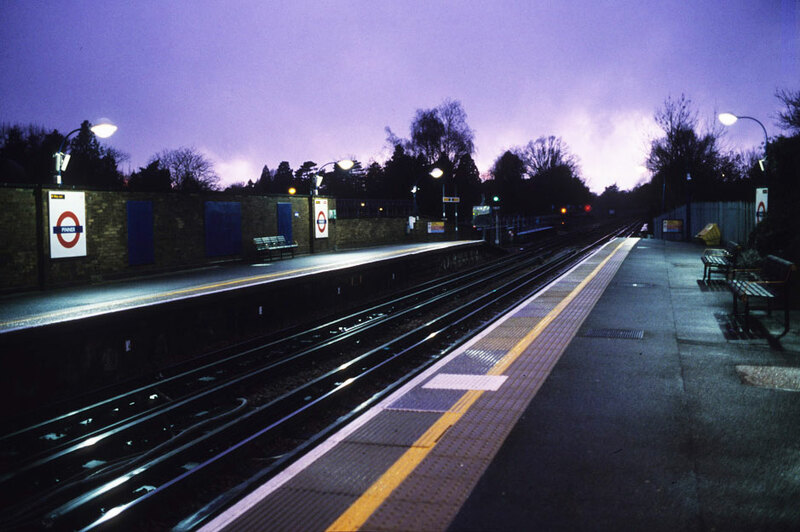 Pinner Station at dusk. © David Secombe 2011. ‘Londoner,’ said Bowman, shaking his head, ‘born in some tedious spot like … I don’t know… Pinner’. ACCORDION MAN: We’re all going to hell. We’re all going to burn in hell. Thank you very, very much, sir. Thank you very, very much, madam. Thank you very, very much, sir. Today marks the 150th birthday of The Tube – and for The London Column’s modest contribution to this anniversary I would like to draw our readers’ attention to the BBC4 repeat at 10 pm tonight of TLC contributor Edward Mirzoeff’s classic 1973 documentary Metro-Land, written and presented by John Betjeman. For anyone that hasn’t seen it, this film is a glorious relic of the golden age of the British television documentary, and takes as its subject the early 20th Century suburbs that grew up alongside the Metropolitan Line as it extended deep into rural Middlesex. As the poet laureate of inter-war suburbia and the Met line in particular, Betjeman is the ideal tour guide for this trip from Baker Street to Neasden, Wembley, Harrow, Pinner and beyond. Pinner is the quintessence of inter-war residential development: serried rows of polite, cheerful villas and semi-detached houses spreading outwards from the remnants of an ancient hamlet. So whilst Pinner Village contains some very old houses indeed, the Metropolitan Line is the reason we are here: Met Line trains from Pinner station take just 25 minutes to reach Baker Street. Pinner’s tidy crescents and avenues were intended as havens from the dirt and clamour of the city – with desirable residences, clean air, the Met Line to take you into town, and the shops and cinema of the new parade just a few steps away, what more could life offer? Naturally, Metro-Land’s quasi-rural calm came at the expense of Middlesex’s actual rural landscape, which entirely disappeared beneath the streamlined semis, but this is a very English approach to Moderne living (as opposed to Modernism, which the British didn’t exactly take to their hearts) – tidy, domesticated, and hungry for acreage. Metro-Land is not so much a place as a state of mind, a dream of what life might be; a bucolic idyll with all the benefits that the Tube, the ring roads, the wireless and state-of-the-art plumbing could bring. But the near-identical streets of Pinner, Eastcote, Ruislip, Rayners Lane and their neighbours are also an expression of a state of unease. The cosy, complacent sprawl of these suburbs comes at a price. The new suburban landscape goaded and inspired Betjeman (‘Your lives were good and more secure/Than ours at cocktail time in Pinner’), as it did George Orwell (Coming up for Air), Louis MacNeice ( ‘But the home is still a sanctum under the pelmets’), Graham Greene (‘a sinless, empty, graceless, chromium world’), Patrick Hamilton (The Plains of Cement) and other writers of the period. They saw fear behind the Deco stained glass. In Dennis Potter’s 1930s-set masterpiece Pennies from Heaven, his doomed travelling-salesman hero Arthur Parker lives in just such a suburb, and oscillates between a joyous fantasy life and an actual life of frustration and anguish. Metro-Land is a perennially vanishing landscape of promise. Close the windows and draw the curtains, a storm is coming. * You can read Andrew Martin‘s hymn of praise to the Tube here – and buy his wonderful history of same here. See also: Pepys Estate, Nights at the Opera, St Pancras, Jubilee, Dmitri Kasterine, Underground, Overground, London Gothic, Trainspotters, Halloween, The Haunted House, A Haunted Bus. Posted: January 2, 2013 | Author: thelondoncolumn | Filed under: Architectural, Gardens | Tags: 2013, Dennis O'Driscoll, Lower Marsh, New Year, Tomorrow poem, trompe l'oeil | Comments Off on New Year. Doorway, Lower Marsh, Waterloo. © David Secombe 2002. Tomorrow I will start to be happy. The morning will light up like a celebratory cigar. dew sparkling like a cut-glass tumbler of champagne. ………………………………………………………………………………………………………………………………………………………………. …© Dennis Driscoll 2004. The remainder of this wonderful poem may be found on the Poetry Foundation’s website. From New and Selected Poems, Anvil Press Poetry. In memoriam Dennis O’Driscoll, 1954-2012.